Figure 1.6 Alga Micrasterias, a green alga composed of two symmetrical halves (100x). surface of either salt or fresh water. Like bacteria, their cell walls are rigid, but their chemical composition is quite distinct from that of the Bacteria and the Archaea. Like bacteria and archaea, many algae move by means of flagella, which are structurally more complex and unrelated to flagella in prokaryotes. Fungi are also a diverse group of eukaryotes. 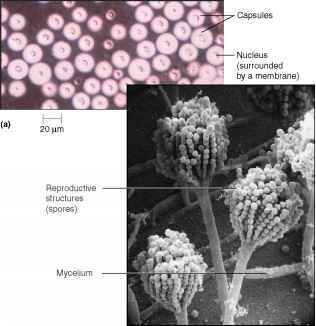 Some are single-celled yeasts, but many are large multicellular organisms including molds and mushrooms (figure 1.7). In contrast to algae, which derive energy from sunlight, fungi gain their energy from organic materials. Interestingly, fungi are found wherever organic materials are present. Unlike algae, which live primarily in water, fungi live mostly on land. Figure 1.7 Two Forms of Fungi (a) Living cells of yeast form Cryptococcus neoformans stained with India ink to reveal the large capsules that surround the cell. (b) Aspergillus, a typical mold form whose dark reproductive structures rise above the mycelium. have a specific shape based on a rigid covering just beneath the outer membrane of the cell. 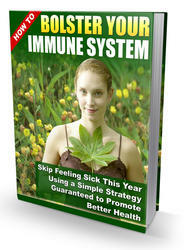 Most protozoa require organic compounds as sources of food, which they ingest as particles. Most groups of protozoa are motile, and a major feature of their classification is their means of locomotion. The eukaryotic members of the microbial world are compared in table 1.3. Figure 1.8 Protozoan A paramecium moves with the aid of cilia on the cell surface. In biology, the Binomial System of Nomenclature refers to a two-word naming system. The first word in the name is the genus, with the first letter always capitalized; the second is the species name, which is not capitalized. Both words are always italicized. 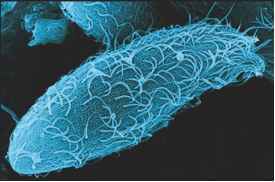 For example, Escherichia coliis a member of the genus Escherichia. Like many bacteria, it was named after the person who first isolated and described it, Theodor Escherich. The species name frequently comes from the location where the organism is most commonly found, in this case the colon. 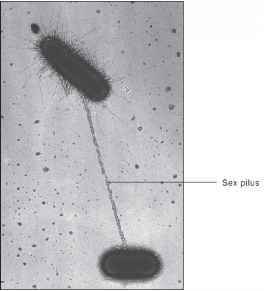 The genus name is commonly abbreviated, with the first letter capitalized: that is, E. coli. A number of different species are included in the same genus. Members of the same species may vary from one another in minor ways, but not enough to give the organisms different species names. These differences, however, may result in the organism being given different strain designations, for example, E. coli strain B or E. coli strain K12.